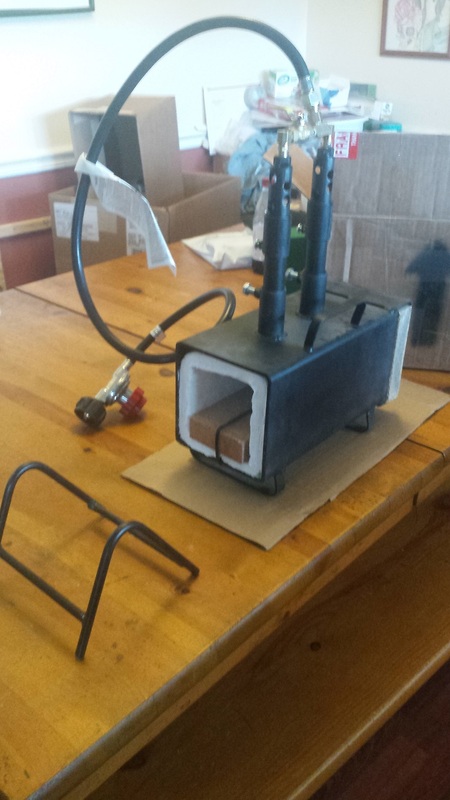 The boys and I were talking about wanting to make some knives, so wife got me a propane fired forge for Father's Day. The only thing that I had on hand when she gave it to me was a piece of who knows what round bar. So I heated it up, chopped off a piece, got out some hammers, and commenced to pounding. I used a piece of Cedar left over from a tree that we removed in the spring for the handles. It's ugly and I made a few mistakes, but I learned alot along the way. I ordered up a few different steels to try next and got some 5160 spring steel, 52100 bearing steel, 1080 and 1084. I have since been told that I should stick to one metal until I learn it, then move on to another one. 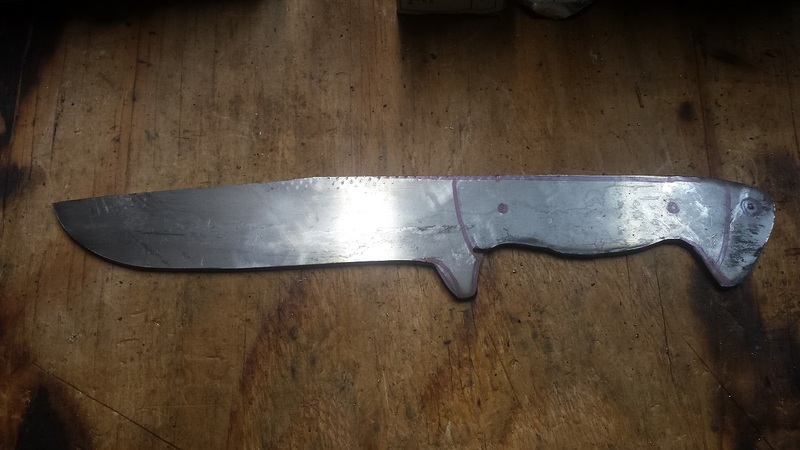 For the second knife, I used the 52100 and went with stock removal instead of forging. The handles are black micarta. I made a few less mistakes on this one. 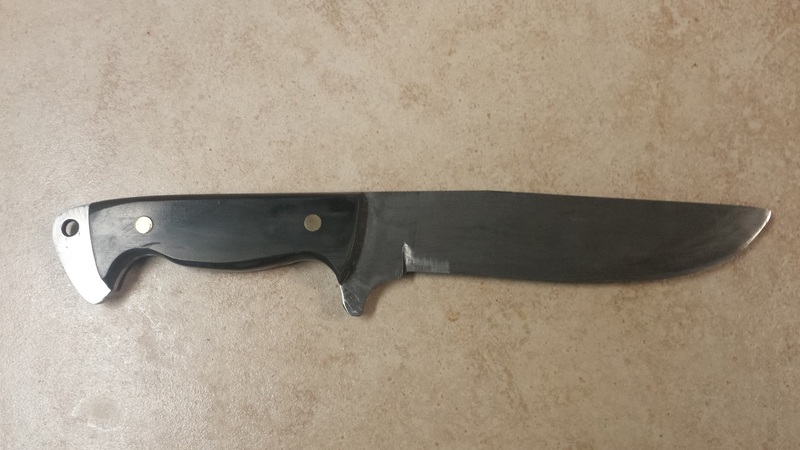 I shifted gears and tried to make a pairing knife for the wife as her birthday is coming up. The blade is 52100 and I found some buffalo horn for the handles. I'm getting closer, but still have a ways to go yet. What would be a good steel to start with for a hunting knife that will be used for gutting, skinning, cleaning, and be resilient enough to cut through the brisket of an Elk? 5160? If your heat treating is good, and the blade design is also good, then any of those steels will make great knives. For heat treating, the 1084 is usually referred to as a good steel for learners like us. It is less likely to warp, isn't hard to get a good finish on, holds an edge well and sharpens easily. When I first started making knives I got some 440c and sent it out for heat treating. I then got some RWL34. I thought that I would try heat treating in my charcoal forge. It didn't go well. I got the steel too hot and when I went to pick it up, the steel tore like wet cardboard, leaving the blade in the coals and me holding the handle in my tongs. I then used some 1084 to make a hunter blade and it went well. I have since bought a heat treat furnace and done a couple of blades from 12c27 and another from the leftover RWL34 and all have gone well. But none of them are really any sharper than the Hunting blade that I made from 1084 and heat treated in the charcoal forge. I used warmed up canola oil for the quench and tempered in a toaster oven. I have a 3' piece of 3/4" x 1/8" A2 that I bought to begin making forged knives, but it's still in the paper sleeve. Just never got started. I'm glad to see you're on your way. And a good start it is too. man, thats look good to me! Functional and homemade, I'd be proud to carry those. How long can that little forge run on a standard grill sized propane cylinder ? I think they said 15-18 hours. I'm still on the first bottle. The road to good knife making may be a little long for some folks but I find it an enjoyable trip. I'm nowhere near the end but my knives are very serviceable and look like a knife. It wasn't always so. Ive made several out of old lawn mower blades. Since this is mystery metal a little experimenting is required to heat treat procedures. For the blades I have, Once made I heat to non magnetic and cool three or four times. This will almost assuredly keep it from warping. I quench in cold water and don't draw back. A file will barely scratch these but a stone will sharpen them pretty quick. I carry one at work and use it daily. When stripping wire or hitting metal it will dull a little. However a few licks on my pocket diamond and its sharp again. I built a flat blade screwdriver into the hilt which I use a lot. Ive done a considerable amount of prying and haven't broke it yet. I would rate the steel at slightly harder than my case pocket knife which I consider pretty good. I have two forging buddies and while we sometimes use known metal we agree that repurposing old high carbon metal is a very satisfying endeavor. Ps. An old rusty wrench from the flea market is well worth the 50 cents. Any pics of the screwdriver hilt??? There are some things I don't like about this knife. I intend to rework or replace it someday. But overall it's pretty handy. 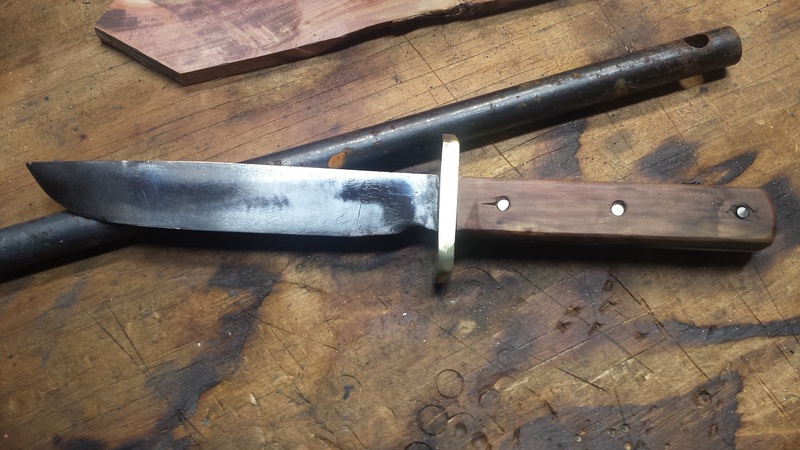 The hilt was drilled full of holes before heat treating and old runny JB weld was applied and leather clamped on. Once cured I trimmed the leather and dipped in melted beeswax. This turned it dark. Ive used it hard daily for a year and the leather has held up well. It also feels good. Soft yet firm just like, well you know. This is how I carry it. 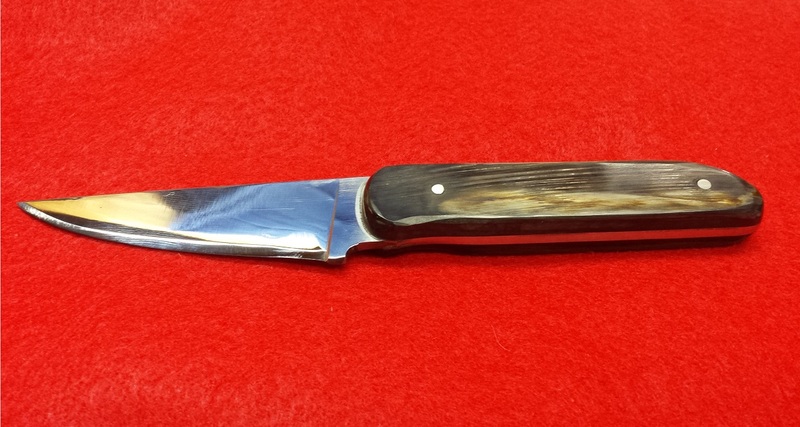 A fixed blade pocketknife. The whole affair can't be longer than your pocket. I don't know why these pics are upside down. I'm just surprised I can post them. This sight doesn't let me post pics easily anymore. In the past it was no problem. Wow I was guessing 3-4 hrs running two burners full out ! Thanks, I'm working off an iPad and can't turn pics around. In the past I had found if I held my phone a certain way the pics would post right. I guess not so anymore. Since this was a prototype I didn't polish the scale off or try to get all the file marks out. Most of it has worn away in the last year though. The one thing I would change is to bring the cutting edge closer to the handle and leave off the notch. I generally like a notch because it lets me sharpen the blade all the way back. But with this knife I often cut plastic off pallets of material and the plastic hangs up back near the handle. Nice setup, nice hawk. What was the doner metal. I assume you made that. Yep, I made it. Not donated..I stole it (brick hammer). Plus I killed the snake.